Big Money may dominate the political arena, but an army of compassionate people can overcome that when hard work and unwavering dedication come together. And there are few more effective armies than the thousands of people and organizations, like The Humane Society of the United States, who fight hard every day for animals abused by industrial meat, egg and dairy businesses. This army of the kind has been on a winning streak in recent years, and recently scored its biggest legislative victory of 2015. Here's what happened: the powerful Arizona meat industry was pushing a deceptive anti-animal bill (House Bill 2150) dressed up to look animal-friendly. 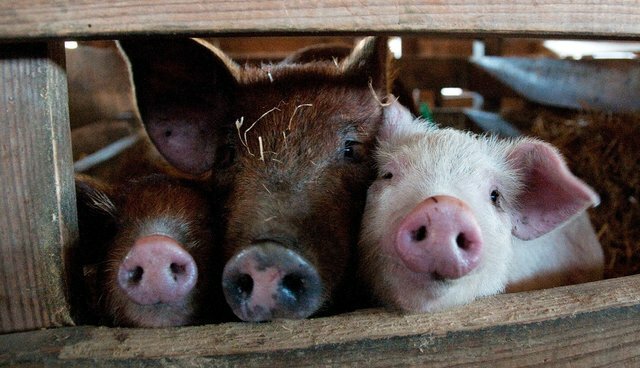 In fact, it would have stripped millions of horses, chickens, pigs and cows of important anti-cruelty protections. The bill also had an "ag-gag" component which would have jeopardized investigations into animal abuse on factory farms, and prohibited local governments from passing stronger animal protection laws in their communities. When the bill passed the legislature, people across Arizona mobilized and an outcry erupted on social media. After the dust settled, 19,251 Arizona residents contacted the governor asking him to veto the bill, while only three (yes, three) spoke out in support. In a move that no doubt stunned the meat industry's lobbyists, the governor vetoed the legislation and issued a strong statement emphasizing the importance of protecting all animals from abuse. So far this year, advocates have also stopped legislative attacks on farm animals in Colorado, Indiana, Kentucky, Minnesota, New Mexico and Washington. Each of these victories represents an enormous effort by caring people across each state and the country. If you have made a call, sent an email, met with your legislator or submitted a letter to the editor, pat yourself on the back! Now the fight is on against another ag-gag bill, this time in North Carolina, and advocates in Rhode Island are fighting hard to get more than 30,000 hens used for egg production out of tiny cages. In fact, there's a lot of work to do: millions of pigs and chickens are still locked in cages so small they can barely move, and lobbyists paid by the factory farming industry are working overtime to keep Americans in the dark about the mistreatment of our nation's farm animals. But every day this movement is gaining more momentum. The well-funded special interests will keep money flowing to lawmakers in the hopes that they'll maintain the status quo in industrial meat production. But, in the words of Mahatma Gandhi, "a small body of determined spirits fired by an unquenchable faith in their mission can alter the course of history." If a small body of people can alter the course of history, just imagine what the animal protection movement can alter the course of history, just imagine what the animal protection movement can accomplish. Matthew Dominguez is the farm animal protection policy manager for the Humane Society of the United States.